Perfectly placed near Golden, CO, Denver Marriott West offers contemporary comfort near celebrated attractions. Unwind in spacious hotel rooms and suites with modern amenities, ergonomic workspace, mini-refrigerators and scenic views. Enhance your experience in an Executive Suite with separate sleeping, living and dining areas, ideal for impromptu meetings or entertaining. Upgrade your stay in an Concierge-level room and enjoy access to our exclusive hotel lounge, featuring complimentary breakfasts, hors d'oeuvres and various other perks. Celebrate and succeed in sophisticated event venues with more than 13,000 square feet of space for everything from corporate seminars for 900 attendees to executive board meetings. When it's all said and done, savor distinctive fare at our Copper Creek Bar and Restaurant, energize in out fitness center or refresh in our indoor and outdoor pools. A pet-friendly hotel with complimentary parking, Denver Marriott West is a stylish haven amid the best of Colorado. Starbucks : Relax in our Golden, Colorado hotel's Greatroom bar while sipping rich Starbucks coffees or other specialty beverages. It's the ideal spot to check email or nibble on tasty breakfast treats before beginning your day. Copper Creek: Copper Creek Bar and Restaurant tempts visitors with its tantalizing American fare and revitalized atmosphere. 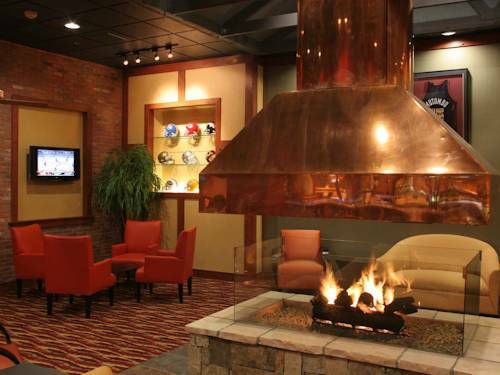 Here, you can relax by the fire while sipping libations, sharing plates or cheering your team on to victory by one of the large flat-screen TVs.